If you own a business that provides services or product on credit, eventually you will have customers who fall past due and refuse to pay. When you determine your customer is not going to pay, you need to hire a collection agency to recover the money your business is owed. Understanding the next steps about how to select a debt collection agency can make the difference between your company getting paid— or not. Once a company realizes how much money it is owed, selecting the right collection agency to work with to recover the balance is the first, and most important, decision in the process. The main consideration for hiring an agency is finding one that operates legally and effectively collects as much money as possible. The debt collection industry has a reputation for being shady and constantly operating within gray areas in order to make as much money possible. Sadly, it isn’t just the debtors who can be taken advantage of. Collection agencies have been known to not pay the money collected back to the clients they are representing. We have created a complete checklist for selecting the best collection agency, ones suitable for small businesses. Agency licensed and bonded- Each state has complex requirements regarding licensing and bonding. A business owner should verify if an agency is licensed within the state the debtor is located so as to avoid Fair Debt Collection Practices Act (FDCPA) issues and potential lawsuits. Ask for recommendations- Speak to other business owners who have used specific collection agencies in the past. How was the experience? Did they work diligently to recover the money owed? Listening to friends within your business network can also be helpful. Verify collection methods- Different collection agencies employ different methods. Some agencies use letters and phone calls, while others pursue debts with private investigators on the ground or attorneys in court. 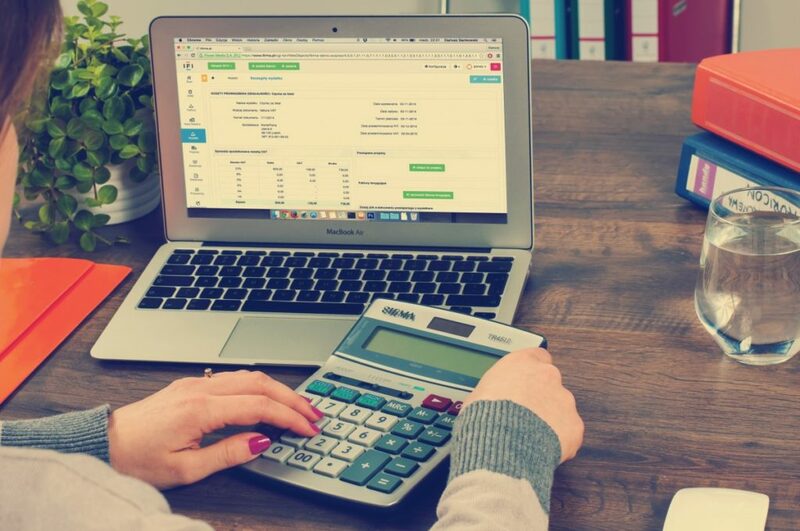 Make sure your business is comfortable with the methods that will be used to collect the money you are owed, along with double-checking that those tactics fall within FDCPA guidelines. ACA International Membership- ACA International is a nonprofit that helps establish ethical standards. When considering hiring a collection agency for your business, ask if it is a member of the ACA International. If so, you can assume it is a quality debt collection agency that will adhere to consumer protection laws, while also producing results. Resources of the agency- When considering whether to hire a collection agency, focus on the resources the company is willing and able to deploy. Do they have access to skip tracing tools? How many experienced collectors do they employ? Does the agency report to all the credit bureaus? Understanding the entire resources an agency can utilize in order to collect the money your business is owed is vitally important to predicting the agency’s success. Experience in industries- You will find that many collection agencies have an area of expertise. For example, one may be expert in collecting medical debt, while others are strictly B2B collection agencies. Make sure the agency can supply you with a list of references showing clients they have represented within your industry before hiring them. If a collection agency has successfully collected for businesses in your industry in the past, that is a good indicator of future successful collections. Better Business Bureau- The BBB publishes ratings for collection agencies, along with complaints filed against companies. Keep in mind, though, that debt collection agencies can get negative ratings from a handful of debtors who are frustrated with the collection efforts. If a collection agency has numerous negative reviews without any positive ones, it may be best to steer clear and locate a different agency. When should a small business hire a collection agency? The earlier you send them the past due account information, the better the chances are that the agency will successfully collect the payment in full. Typically, most small business owners wait 60 days or longer. Some may even wait until the past due account is over a year old! While a reputable collection agency will gladly take an older account, it is important to realize that placing the account with a debt collection agency earlier in the process will ultimately yield better results. The odds of collecting the payment lessen every day as the debtor simply forgets about the account and move on with their lives. When a small business places the first account with a collection agency, you should also setup a clear plan of action going forward for future account placements. Establish a hard cut-off deadline of 30, 60, or 90 days that states when you will place the past due account into collections. How do you know when it is time to place an account in collections? The past due customer does not respond to your collection letters or calls. The customer continues to put off paying the bill, without expressing interest in bringing the account back to a current status. The customer has been late for several months, and despite make a few payments, the account is never paid in full. The customer has a history of not paying other businesses on time or at all. By having a plan in place for future past due accounts, a small business will see these delinquent accounts get collected more quickly. Doing so equals higher revenue in addition to less stress worrying about delinquent customers. Does the collection agency have a history of FDCPA compliance? The FDCPA was approved in 1977 to establish legal protection from abusive debt collection agency practices. Their stated purpose is to stop abusive practices in the collection of consumer debts and, at the same time, promote fair debt collection actions. Essentially, the FDCPA was passed to protect individuals from collection agencies who overzealously use tactics that are unprofessional. It is important to note that FDCPA does not apply to businesses who owe money to other businesses. B2B debtors have no protections under the FDCPA. Communicating with debtors at their place of employment after receiving phone calls to cease. Abusive or profane language used while making efforts to collect the debt. Threatening arrest or legal action that is not permitted. Contacting debtors outside of permitted hours, which are between 8:00 a.m. to 9:00 p.m.
Failure to cease communications upon request: Once cease and desist letter has been received; the collection agency must stop all attempts at collection. Sending letters that have the appearance of court or legal documents, but are not. Not sending validation and verification of a debt when asked to do so by a debtor. After a business has verified that a collection agency is properly licensed and has stayed within the guidelines put forward by the FDCPA, they should feel confident that they are hiring a reputable company. How much do a collection agencies charge? Many collection agencies will collect debt on what is referred to as a “contingency rate.” This term simply means the collection agency will get paid contingent on successfully collecting a payment. For example, if a collection agency charges a 30% rate, it keeps 30% of all the money collected. A $1,000 payment collected would yield $300 for the collection agency, while the business owed the money would receive $700. The rate depends on many factors, but it primarily hinges on the age and type of debt. The range typically falls between 20% and 50%. By hiring a collection agency on contingency rate terms, small businesses aren’t required to invest additional money upfront to continue to collect money already owed to them for services provided in the past. Contingency collection also insures that the collection agency will be motivated to collect as much money as possible, as their earnings is directly tied to successful collections. Check out our Infographic on how small businesses use collection agencies. While you have not been able to make your debtor pay, you can help your collection agency by providing as much information about the past due account as possible. The agency will want to know the circumstances around the debt. For example, was a service provided, and the customer fully satisfied, yet never paid? Name, phone number, and mailing address. E-mail address and social media accounts. People share tons of information on social media. Previous comments the debtor made about owing the money. What service or product provided generated the original invoice. Invoice, Contracts, and Client Agreement forms signed by the debtor. Spouse’s name, friends, parents; anyone who can help locate the debtor. Remember, providing the agency with as much information as possible about the debtor and the transaction involving the debtor and your business will help the agency’s efforts toward collecting the payment. Does the agency I hire need to be local? While supporting local businesses is always appreciated, hiring a collection agency within your city may not be the best idea. Your company should be looking to hire a debt collection agency that has experience in collecting within your industry and is licensed to collect within the state the debtor is located. For example, if you have only two past due customers both located in Florida, then hiring a Florida collection agency would be recommended. If you have a few dozen accounts through multiple states hiring a national collection agency would be advised. Remember, the practice of debt collection is a highly regulated sector and is often target of lawsuits. Make sure when you hire an agency that it are licensed and bonded within the state your debtor resides and where your business operates. How much experience does your collection agency have? While most collection agencies will gladly take on any new client, it is important to find one that has extensive experience in collecting from customers in your industry. Each industry is different and presents new challenges in collection. If your company is owed money from a business, you will get the best results from hiring a B2B collection agency. Business to business debt collection typically involves larger balances; it may require dealing with multiple areas of the business before finally getting to the decision maker s in order to collect the balance owed. The good news is that B2B debt collections do not involve FDCPA regulations, which results in a higher collection success rate on those accounts. If your business is owed money from individual customers, then hiring a collection agency familiar with collecting within FDCPA guidelines is essential. For example, a local construction company may have a few past due customers, both individuals and businesses, that it completed projects for. Hiring a collection agency that has experience with construction companies will yield better results, as they can communicate more clearly with the debtors on the services provided and the payment arrangements that need to be made. Finding a collection agency for small businesses that have experience within your industry can be extremely difficult. Luckily, we have created a large network of collection agencies that have collected successfully within your industry and can provide you with a quote right now. We know that most small businesses never think about having to chase past due customers for payment when laying out their business plans years ago. Furthermore, many business owners do not have a collection agency on speed dial like they probably have a CPA or an attorney. We understand that hiring a collection agency for the first time can be overwhelming, and you may have a few questions. We have attempted to answer the most common questions someone has when deciding to look for a debt collection agency. 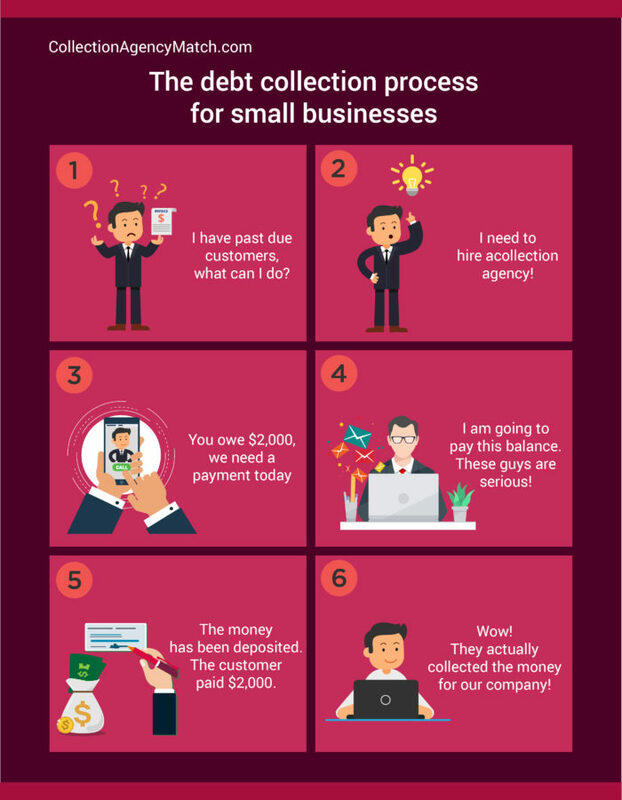 While we have covered many of the bases involved in why a small business should use a collection agency, let us answer a few questions that are most often asked. 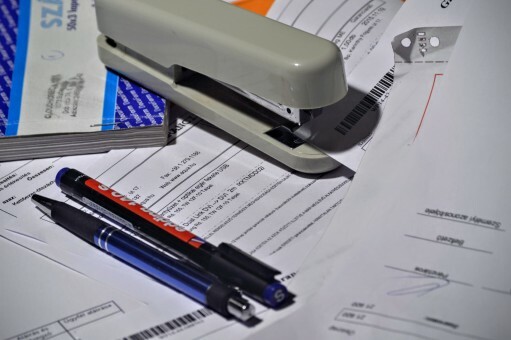 How can the agency find our debtors? Collection agencies have access to skip tracing databases online that are full of personal information that is obtained 100% legally. When a debtor moves, many business owners have no way of knowing what the new mailing address is. Luckily, collection agencies invest thousands in the most up-to-date databases that pull information from various government identities. Most agencies will be able to find phone numbers and mailing addresses that would not be known by the average business owner. How long will our company have to wait for payment? This is dependent on how quickly the debtor is willing to pay the debt. Typically, most successful collections will occur within the first 30 to 60 days of the account being placed. Once the debtor has made a payment, the funds will typically be deposited to your account within a matter of days. Our company only has a small balance account, is it worth it? Yes! Remember, even if you have only one account, it can be collected on. Plus, having a collection agency at your disposal for future past due customers will allow for quicker placements, which gives you a better chance at recovering 100% of the money owed to your company. If the account is over a year old, can it still be collected? Yes, even if the account is over 12 months past due, it can still be successfully collected. While we highly recommended turning any accounts over much sooner, it is better to try to collect now than never. Is it possible to retain the debtor as a future client? Even if a customer is past due, especially in the business to business area, it is likely that you can collect from the client and still retain them for future services. Many times, clients are going through a difficult financial time, yet will still want to do business in the future. Our collection agencies will successfully collect the payment, while representing your business in a professional and positive manner. While the decision to hire a collection agency is typically an immediate action involved in finding out how many past due accounts are currently on the books, there are also many long-term advantages to adding an agency to your business strategy. By hiring a collection agency, you should be able to reduce accounts receivables and increase cash flow because of the successful payments. Doing so will also send a clear message to clients that late payments in the future will always be turned over for collection and pursued. This method will reduce late payment issues, as customers will understand that there aren’t any free rides. Ready to hire a small business collection agency now? The idea of locating the best collection agency for your business when you are new to the process can be stressful. CollectionAgencyMatch has taken the stress out of the search by matching you up with an agency that has the experience, qualifications, and work ethic to get the job done right the first time. Get your debt collection quote now!